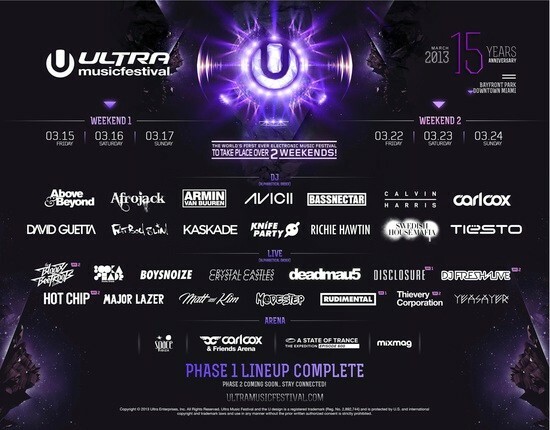 New Year’s weekend saw the release of the Phase 1 Lineup of Ultra Music Festival Miami after Avicii leaked the lineup online. One week later, the festival can now confirm artists that will be performing throughout the 6-day/2-weekend marathon of sound, light and dance. Over the weekends of March 15-17 and March 22-24, Downtown Miami plays host to the event’s 15th year with some of the best DJs, live acts and future talent available. 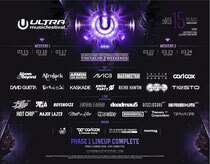 This year’s edition of the festival will mark the final curtain for Swedish House Mafia, who’ve chosen Ultra Music Festival as the ‘One Last Tour’ finale to end where it once began (Ultra Music Festival at Bicentennial Park in 2010). deadmau5 also returns to close out both Saturday nights. Artists who have aided in shaping the movement make appearances across both weekends and include Tiësto, David Guetta, Armin van Buuren and Avicii as well as Above & Beyond, Afrojack, Bassnectar, Calvin Harris, Carl Cox, Fatboy Slim, Kaskade, Knife Party and Richie Hawtin. Look out for the Carl Cox & Friends Arena, which has been announced in addition to Armin van Buuren’s A State Of Trance 600 Arena. Mixmag will also slam into the sunshine with an area of their own and Space Ibiza will bring Phase 1 of Ultra’s 15th Anniversary to close with the return of their own Space Ibiza Arena.